Charles Bibby was born in Manchester, England on September 15, 1880. The son of a Confectioner, Bibby was the oldest male of four children. After studying accounting and becoming a public accountant, Bibby immigrated to Canada with his wife Mary Swain (1881-1967) in March 1903. The couple settled in North Bay where Bibby worked as a clerk, and later as an accountant for the Canadian Pacific Railway (CPR). The Bibby family suffered several tragedies while in North Bay with the deaths of three daughters (Isabella Bibby June 1902 [Lancashire, England] - January 10, 1904 [North Bay, cause: bronchitis for 2 weeks], Georgina May Bibby September 14, 1904 - August 28, 1905, [cause: diarrhea for 3 weeks], and Beatrice Bibby October 1, 1905 - September 3, 1906 [cause: diarrhea for 5 weeks]). On October 19, 1910, the couple had their last and only surviving child Charles Fredrick Bibby (who later became Warden Bibby with the Ministry of Natural Resources). Shortly afterwards (before June 1911), the Bibby family moved to Sudbury due to a transfer with the CPR. While in Sudbury, Charles Bibby continued to work for the CPR and later gained employment as an accountant for the Sudbury-Copper Cliff Street Railway until his retirement in 1945. He also belonged to the Nickel Lodge 427 of Ancient Free and Accepted Masons (he was initiated in Sudbury in 1918, became a Worshipful Master in 1924 and a Grand Steward in 1959) as well as the Tuscan Chapter 95 Royal Arch Masons, Mavar Preceptory 65, the Sudbury Shrine Club, and Rameses Shriners Temple in Toronto. In 1928, Charles Bibby was elected mayor of the Town of Sudbury and was re-elected in 1929, the year before the town became a city. Charles Bibby passed away on August 7, 1970 at the age of 89. Item was donated by Barry Smith who found it inside a bound Statutes of Ontario volume in his attic during the 1970's. Prior to Barry Smith, the house had only two owners; Mr. H. Matheson (from 1935-1947) and Charles F. Bibby (from 1948-1976). 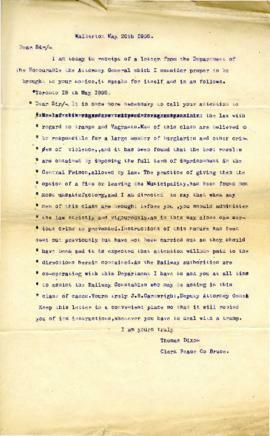 Since Mr. H. Matheson did not work for the railway, the item belonged to the Bibby family. None of Roberta Bibby's relatives worked for the railway but Charles F. Bibby's father, Charles Bibby did as a clerk during the time period in question.